At some point in their life most, if not all freshwater fishkeepers will want to give it a try at keeping plants. Planted tanks are becoming more and more common amongst hobbyists. The ever growing amount of stunning aquascapes online as also help fuel this shift in the hobby. While these ones are definitely stunning and fuelled everyone’s desire to keep plants, one does not need to go to such lengths to be able to keep plants. That said, you can be the best fishkeeper, be able to turn your rocks and wood into amazing and intrinsic hardscapes, you even have the most expensive equipment and yet still fail. At the heart of it a planted tank, is still about keeping plants. If you can’t grow plants, you’ll struggle at keeping a successful aquascape. Does that mean I can’t have one? Not at all, as our knowledge and technology has advanced, what was once viewed as a niche area, only meant for the most experienced hobbyists, is now at the grasp of everyone. But you’ll still required to know how to keep plants, and what do they need. Plants rely on photosynthesis to grow.Photosynthesis is the process through which plants absorb light and use it as energy to convert carbon (CO2) and water into the molecules required for them to grow. Basically plants absorb light through chlorophyll in their leaves and use it to convert water and co2 into glucose. This process also produces oxygen (O2) as a waste product. The following formula summarizes the process. So what do plants do with this glucose that’s being produced? Inside the plant various chemical processes occur, but to sum it all up in a way that’s easy to understand, some of it is used by the plant to grow, the remaining is converted to starch and stored in the plant. The plant can access this stored starch and convert it back to glucose in the future if it needs it to keep growing. This is actually an over simplistic explanation of a process that in itself is quite complex, but from the perspective of the average planted tank hobbyist it’s more than enough to know what’s needed to grow plants. So how do we translate this back into an aquarium? To grow plants in our aquariums we need light, co2 and nutrients. These are the variables for photosynthesis to occur. And when I say variables I mean it, because requirements of these three change from tank to tank. And to make matters worse they also change between different species of plants. By now many of you are ready to assemble a power station next to the tank, use fizzy water in your next water change and dose an insane amount of nutrients into the tank that even your fish will begin to photosynthesize. All of this for the sake of having the healthiest plants there can be. Don’t say no? We’ve all been there. Unfortunately things are not that easy, nature is balance, as such if we want to create a piece of nature inside our living rooms we need to understand that it also needs that same balance to thrive. And it’s a very thin line between a balanced healthy tank and an unbalanced unhealthy one. So if you are assembling a high-light planted tank in order to achieve balance you’ll also need to dose high amounts of co2 and nutrients. On the other hand if you are using a low light setup, the plants metabolism will work much slower, hence there will be no need to add too much light or co2. If you dose high light, high nutrients and low or no co2 obviously the equation is not balanced, by increasing your light you are accelerating your plants metabolism and with that acceleration comes a much bigger demand for co2 and nutrients. If Co2 is lacking, then the plants metabolism will accelerate and require more nutrients which in the end they cannot use because of a lack of co2. This will lead to unhealthy, stunted growth, dying leaves and most of all algae. Algae are simple organisms, unlike plants that are complex they have the same needs but they do not need a balance to survive, they’ll survive on whatever is available to them. Which makes balance all the more important, if your tank is not balanced algae will thrive on whatever is surplus. That high amount of nutrients that your plants can’t use because of the lack of co2 will end up being used by algae. 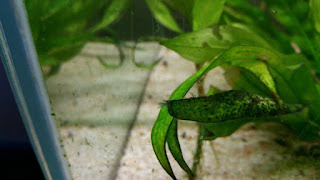 I am not saying excess nutrients cause algae, but once algae blooms in your aquarium they will feed on anything they can find including excess nutrients. Do all plants need the same? You’ll need to take in consideration the plants natural requirements to survive, these plants come to different places and environments and throughout the years adapted to different conditions, a plant that is demanding in light,co2 and nutrients will not do well or most likely die in an environment that does not meet its needs. Likewise a plant not demanding in light or nutrients will probably suffer in a high light setup, as there will be an excess of light, nutrients and co2 that they cannot use. It’s common to see low light plants like anubias covered in black beard algae, to minimize this aquascapers tend to use these plants in shaded areas when in high tech environments. How can one achieve that balance? I would say trial and error, even the most experienced aquascaper will find himself with an unbalanced tank at some point, the difference is throughout years of trial and error he now has enough experience to understand what’s really happening in his tank. But we are now at a point where throughout years of trial and error from the community and the help of the internet a beginner does not need to go blind into the hobby and he can actually avoid much of this trial and error. Light is the energy the powers the entire photosynthesis process, the more light the more co2 and nutrients will be needed, the faster things will happen in the tank making it harder to keep that balance. So by cutting down the light intensity or lighting period one will reduce the demand for co2 and nutrients and make balancing the tank easier. There’s a lot more factors in co2 diffusion and nutrient dosing in the water that may affect how much there is available, but with light there’s complete control. That’s why you can use it as the limiting factor. There is a catch though, growth will also be slower, but a lot of people actually prefer this than having to do big plant trimmings every few days. f you are using dry salts it becomes easier to make sure your plants have the nutrients needed available. EI dosing stands for extimative index and it was created by Tom Barr. Basically Tom did experiences to find out the maximum of light the plants could use, then he measured how much nutrients the plants would need when given that maximum amount of light. By knowing this he was able to create an index where you knew that if you dosed that amount of nutrients your plants would always have enough. That’s called the maximum uptake. Obviously most of us do not get near that maximum uptake, but it does not matter has long has you meet that value you know you’ll have enough to keep your plants growing. Obviously this leads to a build-up of nutrients in the tank, to solve this 50% water changes are done once a week to reset the tank and keep the nutrients from building up too much. With experience one can dumb down the dosing to fit his own needs and that’s why it’s and extimative index. This method relies on plant growth to keep your tank balanced, a lush and healthy plant mass is the best way to keep algae at bay as plants will outcompete algae for nutrients when everything is balanced. This is an older method, one that I am yet to try and won’t elaborate much. Instead of dosing a maximum uptake it’s actually the opposite. With PPS pro you do a leaner dosing regime, meaning instead of doing maximum uptake as in EI you’ll dose what your plants really require. It’s still a bit of guessing as tests are not that accurate, but unlike EI where testing is not required you’ll be required to do some testing here. The idea is to avoid excess nutrients and nutrient build ups by giving to the plants exactly what they need to grow. This avoids the needs for large water changes. While EI dosing rellies on plant growth to keep algae at bay, PPS pro aims more at nutrient control to do it. It is also cheaper as you’ll be dosing less. 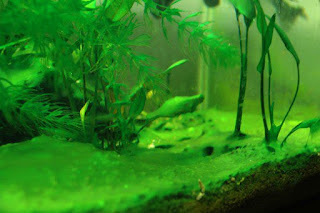 Most of the times someone has algae it’s due to lack, poor co2 in the tank or variations during the light period. So it’s important to make sure plants get all the co2 they need. The maximum concentration of co2 deemed safe for fish is 30 parts per million or ppm, a drop checker can be used to measure this amount. As long as that drop checker shows a strong green colour you’re giving enough for your plants to grow. Obviously the amount of co2 needed is much less on a low-light setup. Using a timer to start dosing co2 one or two hours before lights on also helps make sure that you have enough co2 dissolved in the tank when your lights come on. But to put it simple you can have all the co2 and nutrients in the tank and your plants may still struggle. That’s normally due too bad water flow. Those nutrients and co2 are useless if they can’t get to the plants, so we should always, make sure we have enough flow in the tank to maximize co2 and nutrient distribution. It’s more than just high flow, it’s more about efficiency, powerheards and filter inlets and outlets should be positioned in a way that flow around the tank is maximized to allow co2 and nutrients to reach the plants that need it. At the same time it will also give some peace of mind in case you forget to dose your fertilizers every now and them. While I believe the EI dosing method to be great I believe a good substrate is essential for good plant growth and helps them establish their roots faster. In many cases it will also allow you to do a leaner form of dosing. I guess that’s all about it, in this article we discussed how plants grow through photosynthesis and what it is needed for this process to occur. We also found out that a fine balance needs to exist to keep a healthy planted tank as well as some tips on how to help to make this balance easier. I hope this was helpful and if you have something to add please let me know in the comment section.